Pressure-compensating for constant flow from 20 to 80 psi. Anti-clogging dome screen filters sediments and particles. Color-coded to identify flow rate. Virtually unbreakable single piece insert ensures a longer usable life. 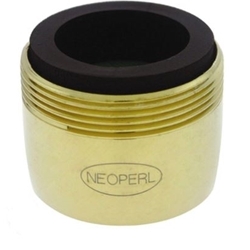 Compatible with all NEOPERL® regular male housings, vandal proof and metric size housings.